Today we focus on the environmental impact of the coffee trade and what consumers can do differently to help. Coffee. It’s the beverage that many of us rely on to galvanize us into action in the mornings and in today’s world, it’s more than popular: it’s ubiquitous. But coffee is so much more than just a drink. As the world’s second most tradable commodity after oil, coffee is now a multibillion dollar global industry and growing. We are all aware of fair trade coffee but have you ever stopped to think what impacts the world’s favourite beverage is having on our planet? Coffee comes in many shapes and sizes. Some brands focus on being organic, carbon negative or non-GMO while others are not as environmentally friendly. The burgeoning coffee culture that has sprung up over the last few decades has led to an overwhelming increase in demand for this liquid gold which has had a knock-on effect on the environment, with monoculture and sun grown coffee now the norm. And given that most coffee growing regions are also home to some of the most delicate ecosystems on earth, the potential for serious damage is great. Coffee is typically cultivated in tropical and subtropical areas at high elevations, often in rugged mountainous areas and naturally grows under a shaded canopy of trees. Traditional coffee is often integral to agro-forestry systems in which tree species are cultivated together with coffee and other agricultural commodities. These regions are home to many different floras that contribute to high biodiversity levels. The sheltering from canopies also provides a valuable habitat for indigenous animals and insects, as well as preventing topsoil erosion and removing the need for chemical fertilizers. Moreover, because many traditional methods have been passed down to todays’ farmers by previous generations before synthetic pesticides and fertilizers were widely used in agriculture, a human-land use equilibrium has evolved in traditional coffee production over time. However, due to increased market demands in recent years, this innocuous form of agriculture has been superseded by “sun cultivation” techniques. 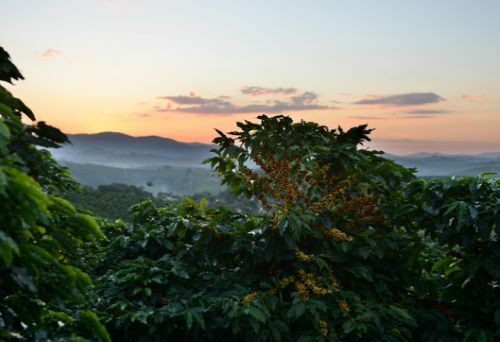 Originating in the 1970’s, sun cultivated (or sun grown) coffee is produced on plantations, where forestry is cleared so that coffee is grown in rows as a monoculture with no canopy. Sun cultivated coffee, in concert with the necessary addition of fertilizer, creates the highest yield of coffee, but eliminates the diversity of plants which support an array of insects and animals, posing detrimental impacts to the biodiversity of the region, as well as other environmental harms. Farmers have been positively encouraged to replace their traditional and supposedly inefficient farming methods with the higher yielding technique of sun cultivation, which has resulted in over 2.5 million acres of forest being cleared in Central America alone to make way for coffee farming in this way. Deforestation trends are serious throughout the coffee producing lands of Latin America and remarkable biodiversity values are at stake. Latin America’s tropical forests are critical ecologically for purposes of protection of atmospheric dynamics, water quality, wildlife species, as well as economically. Contamination of waterways also pose serious environmental threats from the processing of coffee beans. Largely irrespective of how coffee is grown, discharges from coffee processing plants represent a major source of river pollution. Ecological impacts result from the discharge of organic pollutants from the processing plants to rivers and waterways, triggering eutrophication of water systems and robbing aquatic plants and wildlife of essential oxygen. Traditional coffee is often integral to agro-forestry systems in which tree species are cultivated together with coffee and other agricultural commodities. This cultivation of coffee relies on much lower chemical inputs than industrial plantations due to the other plants reducing the susceptibility to pests. However, sun cultivated coffee often employs intensive pesticides and chemicals that present serious health and ecological concerns. The World Resources Institute (WRI) carried out a recent study that reported extensive human exposure to pesticides in Latin America and elsewhere in the developing world. The correlation between increased nitrogen fertilizer application and the widespread removal of shade cover from Central American coffee plantations is evident, with these heavy synthetic fertilizer inputs contributing to increasing contamination of waterways and aquifers. Unsurprisingly, there is also an enormous amount of waste produced during the manufacturing of coffee. The process of separating the commercial product (the beans) from the coffee cherries generates enormous volumes of waste material in the form of pulp, residual matter and parchment. Over a 6 month period in 1988, it was estimated that processing 547,000 tons of coffee in Central America generated as much as 1.1 million tons of pulp and polluted 110,000 cubic metres of water each day. This excess waste can also play havoc with soil and water sources as coffee pulp is often dumped into streams, severely degrading fragile systems. Recent years have witnessed important progress in the development of environmentally sound measures due to recognition of such wastage. This includes composting coffee husks mixed with farm animal manure to use as organic fertilizer in farming practices. The environmental impact of the coffee trade impacts the Earth’s soil as well. Soil quality suffers when sun cultivated practices are favoured over the traditional growing means. The elimination of shade cover can cause significant impacts on various soil quality parameters, with higher rates of erosion occurring on renovated coffee plantations where vegetation has been reduced. An environmentally favoured alternative to sun cultivated coffee is shade grown coffee. In this method, coffee plants are interspersed beneath local forest trees, mimicking the way coffee grows naturally in these regions. According to the American Birding Association (ABA), shade coffee plantations are second only to undisturbed forests as the best habitat for birds and other fauna in Latin America. What’s more is the presence of vegetation amongst coffee plants reduces the need for intense herbicide preparations, supports at least 50% of the original forest snakes and spider fauna and protects topsoil effectively. Where can I buy shade grown coffee? Mt. Whitney notes that it is a nonprofit and “After expenses, all profits from the sale of our coffee is donated to Father’s Heart International.” Father’s Heart International is apparently a charity that helps children in Zambia. Notes: Grown at 1500 Meters in Peru and is comprised of a single crop. Java Planet notes that it is sourced from farms that use a “combination of foliage cover, tree height and biodiversity to provide quality habitat for birds and other wildlife”. Notes: Distinguished on Amazon, not sourced through Direct Trade. Notes: Family-run business, single origin in Costa Rica grown at an altitude of about 5,200 feet. Just be sure to vet the company that is selling the product to make sure they are properly certified. For instance, the third choice above is sold by Volcanica Coffee Company. If you go to Volcanica’s website, you will see the official seals listed below next to their products. These seals prove that the company has met the Fair Trade Alliance and Rain Forest Alliance’s requirements and is officially certified. The environmental impact of the coffee trade is significant, but consumers can do their part by buying environmentally friendly and responsibly sourced coffee. What are your views? Have you ever bought shade grown coffee? Victoria Moore holds a first class honours in Geography and an M.Sc. in Environmental Governance from Manchester University. She has worked as a geography tutor and recently returned from a six month journey through Asia. Victoria is passionate about the environmental movement and aspires to have a positive impact on the planet through her work and play! Interesting post. I’m currently doing a project on the Life Cycle Appraisal of Nestle Instant coffee and the impact the product and the company has had on the environment. Do you have any recommendations on any articles which would help in calculating the carbon footprint of Nestle coffee at any of it’s LCA stages? I am doing a research project on Coffee, and it’s impacts around the world. Perhaps, you could recommend any particular websites. Including information, relating to my topic. Hi Kathy, i’m a swiss student and i’m doing research on the environmental impact of coffee too! would you in share some information with me? i would really appreciate it! Hi, I was wondering if I can get some help. I really want to use the information from this article and I need to cite it, but I cannot find the date that this article came out? Hi Leslie, the article was published in 2013. All the best! thank you for this article it really helped with my assignment! Hi Victoria, a most informative, well written article. I am currently writing a book on how little choices can have a huge impact on the environment. Your article was extremely helpful. While I can’t go into all the detail you did I must present the importance of making informed choices when it comes to this popular morning brew. There is a small coffee company in Canada that is addressing deforestation and waste in a progressive way – they have invented and produced the worlds FIRST solar powered coffee bean drying oven, in Honduras, used to DRY the coffee beans after harvesting. (Few people realize that coffee beans have to be dehydrated to reduce the moisture content before the green beans are shipped north, to American markets, for roasting and distribution. Many farmers in rural areas are forced to clear cut forest in order to fuel the fire to their beans, but the ‘Cafe Solar’ product, produced by a women run cooperative in Honduras, uses a giant solar oven to do this!! And at night, to keep the oven working, they use a special bio-fuel developed from the coffee husks themselves. Further, the farms that supply this cooperative are part of the IOC protocol – integrated open canopy. This is a new designation that is even BETTER than shade grown. Farmers located in a special land corridor through central america are encouraged to devote 50% of their land to reforestation/natural habitat, and 50% to coffee farming. In doing so, the land is left completely alone along key migratory routes for birds and animals, and the farmers are paid a carbon credit – a guaranteed income to their family. The entire process is not only sustainable – it is replenishing to the earth and its resources. It is remarkably innovative. Check out the Merchants of Green Coffee Company in Toronto, Ontario. One of a kind!! Truly. We live next door to a large coffee roaster who roast 5 Days a week. They roast on site for their coffee shop + 2 other coffee shops that they own + they wholesale on line & sell roasted beans at their shops, this is a lot of roasting. The emissions we believe are posing health risks to us i.e. chaff & the acrid smell & unbelievably they have coffee drinking patrons sitting right next to the roaster while in operation. Hundreds of hession bags full of green beans are stored between the drinking area & the rest room, surely this is a health problem. I found this article helpful for an assignment I was doing wine and grape production and found nothing so I considered reading up and tea and coffee to see if I could find something to do my task on instead, before I make a descisin to change does anyone have links of the environmental impacts of the production of wine and grapes.